The President of the Shark Research Institute (and founder of Shark Protect in Germany), Baron Jupp Kerckerinck zur Borg, was interviewed by Frank Elstner on the German talk show Menschen der Woche. The show had 800,000 viewers and the interview runs about 15 minutes. Jupp eloquently discusses the plight of sharks and the ocean, and presents superb footage of sharks -- including a segment in which a large tiger shark very gently takes a diver in its mouth and then releases him unharmed. Here is the link to Jupp’s interview. 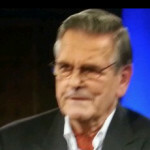 http://dl.dropbox.com/u/7030799/Menschen%20der%20Woche%20-%20Talkshow%20mit%20Frank%20Elstner%5BiPH%5D.mp4 It might take a few minutes to load.